Two recent recalls by the US Food and Drug Admininstration (FDA) of Zimmer’s Trabecular Metal Technology, one in dental implants and the other in shoulder implants raise concern. 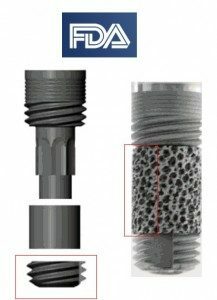 In the case of the recall of the Trabecular Metal dental implant: The Zimmer Dental voluntary device recall resulted from an investigation into the February 2012 complaint involving an apical tip of a 4.1mm D Trabecular Metal Implant which separated from the implant assembly during surgery on a patient with a dense (Type D1), thick, inferior border. The recall correction includes adding precautions to the Instructions for Use regarding the placement of a 4.1mm Trabecular Metal implant. While the shoulder implant recall: Zimmer Trabecular Metal TM Humeral Stem is a shoulder prosthetic replacement device that is indicated for the treatment of severe pain or significant disability in degenerative, rheumatoid, or traumatic disease of the glenohumeral joint as well as humeral fractures. The humeral stem uses. Trabecular Metal around the proximal part of the stem for biological ingrowth. This single manufacturing lot has the potential for the bond strength between the Trabecular Metal material and substrate to be below the minimum required specification. Testing found bond strength approximately 80% of the minimum required by specification in one of the three zones of the Trabecular Metal. The other two zones exceeded the minimum specification.